Volunteering: Easy to get to Programs. Small Investment. Big Rewards. 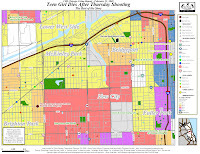 I make maps that show city boundaries, locations of "failing schools," the 2000 Census bureau's poverty tracts... and then overlay these with locations of community assets and known non-school tutoring and mentoring programs. The feedback I receive on patterns that emerge range from concern to shock to outrage. But we at Tutor/Mentor Connection don't stop at exposing the clear lack of quality tutoring and mentoring programs - programs that exist as options for students who need a little help to compete for college placement, jobs, and ultimately community/business/political leadership. We also propose comprehensive solutions. 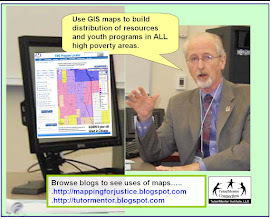 My maps are free tools that business leaders can use in creating strategies that invigorate the local economy through investment in - and philanthropic funding of tutor/mentor programs. We propose solutions to the problems that concern communities - strategies that universities, hospitals, places of worship, and concerned parents can use to address issues of crime, violence, and poverty. And we encourage the media to provide tutoring/mentoring-based solutions when discussing problems associated with inadequate school facilities, poverty, and gangs. But one part of a comprehensive solution to the lack of non-school tutoring/mentoring options... a part that I frequently tend to gloss over... is you and your ability to volunteer as a one-to-one mentor for students at the programs. Simply, without volunteers, there are no programs. That's what this is all about: Pairing students with volunteers in long-term relationships whereby the student gains needed help on homework (tutoring) and needed direction in developing a course of action that will put her/him on college and career paths (mentoring). Many of these kids do not receive this guidance at home and are a bit lost on how to get there from here. You've been there. For an investment of a couple hours each week, you can answer so many questions that seem simple to you but are not for the students. "How do I research schools? How do I fill out an application? Where do I start?" For this same investment, you get to meet an amazing kid, and grow yourself. The volunteers at a tutor/mentor program like Cabrini Connections almost invariably report personal fulfillment and growth as a primary factor in staying on year after year. Some of you think this sounds great, but how do I get there? "I commute on train... I don't have a car. I don't have a lot of time!" Not surprisingly, many programs are within seconds of a stop on your Metra line. If you have a monthly pass, as I do, perhaps you might consider jumping off for a few hours and then jumping back on after working with a student on an art or tech project? ... And if you think outside the box a little bit, you might be able to combine efforts/communter options to make an even easier customized solution to your transport/volunteer concerns. For instance, many people may be concerned with venturing alone into unknown high-poverty areas of the city. Who wouldn't be? Look at the highways in relation to programs and commuter rail in the maps above. Perhaps a safe, effective, and efficient strategy might involve carpooling to your downtown job with friends/coworkers (saving gas), heading to a program near a Metra stop with one or two members of the carpool, and then using Metra to head home together after a couple hours of tutoring? I hope you use these maps to find a route that takes you to a program of your choice one night a week. Without your help... without volunteers, programs can't grow. New, needed programs can't start. Please click on either of the maps above to get larger, detailed maps, to get started. For details on the specific CTA Stations, please visit the CTA system map. For details about Metra Stations, their website is here. And for details about the programs that are near stops on your commuter line, visit the Tutor/Mentor Connection's online searchable Program Locator. For information about volunteering in general , go here. Recently I blogged on separate occasions about a frustrating phenomenon whereby the mass media rehashes the same "CPS Student Murdered" stories over and over - only to let the story go when distracted by something else. There's rarely a discussion of solutions before they leave. I'm happy to report that an editorial in the Suntimes this week does just that. 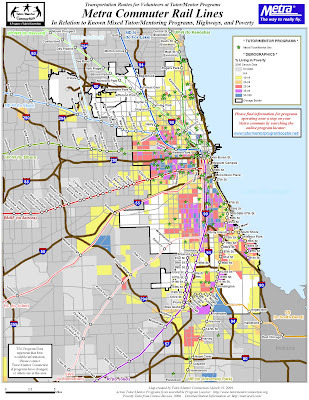 and try to imagine how easily my maps, and Tutor/Mentor Institute strategies might be incorporated into the "comprehensive strategy" proposed the Chicago Public Schools (CPS), political leaders, and the editorial writer, in the fight against teen violence. So how do I think adding tutoring and mentoring to a "comprehensive strategy" to fight teen violence would help? Well let's start by looking at what is being proposed by those mentioned in the editorial. The editorial reports that Ron Huberman (former CTA chief, and newly-appointed Chicago Public Schools boss) is "identifying schools that have what he calls a 'culture of calm' (respect between adults and kids, no kids hanging out in the hallways) and trying to export that culture to schools that clearly could use it." Ok. School culture. I would ask: Is a chaotic school culture the root of the violence problem or a symptom? Let me say that I understand that the CPS boss is looking at the schools themselves in finding solutions. Fair enough - that IS his jurisdiction after all, right? But I hope he would look deeper than "culture" in his pursuit. So what else is he doing? "School officials compiled [shooting] data to look for patterns." ... with some clear patterns. 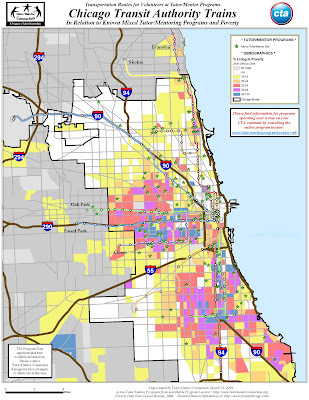 We see a lot of poverty in the vicinity, a bunch of "failing" schools, and a notable absence of non-school tutoring and mentoring program facilities for kids who are hanging out at 3:15 in the afternoon. Most of my "Rest of the Story" maps have the same patterns. What is Mr Huberman doing with his data and patterns? 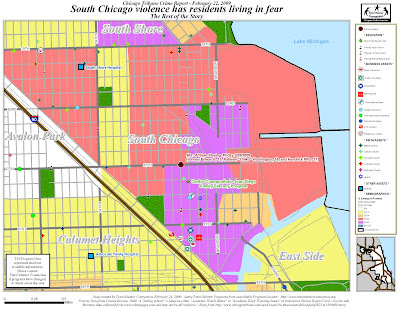 "Huberman, well-known for his love of data, is analyzing shooting patterns, transportation routes, gang turf boundaries and school attendance boundaries. That data will be used to devise safer routes to school for kids in risky areas, with a team at each school monitoring and updating the routes." Anything else in the comprehensive strategy? Well, according to the article, the CPS points out that none of the shootings actually happened in school, and that most of them occur near the students' homes. The CPS seems to be doing what they can to get students safely to their facilities, and trying to somehow import a "culture" of calm to maintain order in the hallways. It almost feels like that's all they feel they need to do. Ok, then who in the community will step up and offer leadership beyond the jurisdiction of the CPS? The editorial tells us that state Representative Monique Davis is introducing a bill that "would require schools in violence-prone areas to hire a full-time social worker (most have only part-time help)." The writer of this editorial agrees that this would be helpful but is concerned that it is still "not sweeping enough and, without a clear funding source, could simply be another unfunded, burdensome mandate." I agree, but would add that I am concerned that political leadership, in looking for solutions to violence in the community, is pointing fingers at the CPS as the place to address the problem. So what does the writer of the editorial think would help? The writer adds that "one answer lies in compelling schools to adopt a radical new approach to teaching -- one that ... teaches basic skills that many kids don't get at home, such as how to get along and how to empathize -- skills that research shows improve test scores and behavior." So now we have a "comprehensive solution" (with everyone pointing at the schools to fix the problem) that involves looking at shooting data to ensure safe transport of kids through war zones... magically funding additional social workers at schools... and adding 'mentoring' to the already-burdened workload and curriculum of a teacher (who also gets pressure to forego teaching in order to coach 'test-taking' in last-minute and desperate attempts by administrators to improve results on standardized tests... results which are often used to penalize and sanction "failing schools"... the ones in black on my maps... the ones engulfed in poverty and - according to the patterns my data has revealed on this blog - the ones likely to be found near the site of media-reported shootings). Here is an idea. And please do continue to make sure kids are getting safely to and from school, however that is implemented. Fine. But can we PLEASE address the problem at its root? What is the appeal of a gang? Why are kids violent? Here is my guess as to how this might work. Granted I am no sociologist, but tell me if this doesn't seem common sensible: Poverty and no career options = hopelessness. Hopelessness breeds anger. Angry and impoverished adults and adolescents need to survive. We're all living in a capitalist system where money is needed to survive. If there is no career path, there is money on the streets. Can you see the appeal to crime? Crime is often organized by gangs. Violence is a natural product. But what if there was REAL alternative "career path" to the streets? My guess is many would-be gang members would consider it. Here's where Tutor/Mentor Programs fit in! Tutor/Mentor Programs give kids a safe place to work on skills needed for the job market... with real volunteers who have been to college and have developed their marketable skills. I hear skeptics scream all the time (referring to kids as "they" of course), "Their parents should be doing this job. Not me." The same skeptics tsk and moan about all the violence. Look - the issue is not whether or how parents can do a better job. The reality is that these are KIDS. Kids who aren't getting the guidance and support you got, for whatever reason. Some of these kids end up playing an angry and violent game with the cards they've been dealt. Kids. I propose that any "comprehensive solution" to violence might include proliferating tutor/mentor facilities, and stocking them with volunteer tutors/mentors who can offer kids living in poverty skills to use in careers, versus those learned on the streets. Without the programs, the burden of providing kids this training falls on overworked teachers, and parents who may not have the experience to properly guide children out of poverty and into functional society. This is the current system. This is the "new comprehensive strategy." It doesn't work alone. Tutor/Mentor Programs are at least one of the missing components. 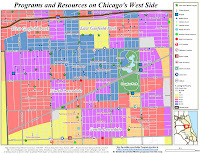 So it is my hope that, in addition to finding funding to staff more social workers in CPS schools (good luck)... and in addition to procuring safe passage to schools, political, business, and community leadership will include my maps in their analysis of data... and explore strategies that improve support for tutoring and mentoring when developing their "comprehensive strategies." And it is my hope that WE ALL do what we can to encourage the leaders to support this vision, the programs, the kids, and a less violent society.